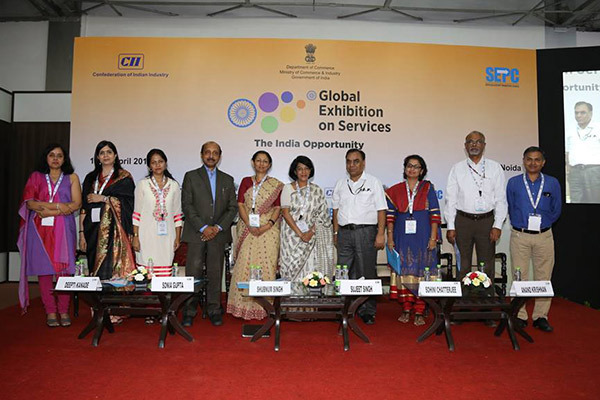 The Ministry of Health and Family Welfare, Government of India, invited New Horizons Child Development Centre and Research Foundation at the Global Exhibition of Services in Noida on 18th April, 2017. Ms. Sohini Chatterjee, Psychologist (M.A., Clinical Psychology) and Clinical Director of New Horizons Child Development Centre and Ms. Deepti Kanade-Modak, Psychologist (M.A., Clinical Psychology) and In-charge of Research Foundation presented work done by New Horizons with children with Neuro-developmental Disorders (NDD) in Mumbai along with being on the panel discussing the role of community based work in this area along with liasoning with schools for early identification and intervention. (L-R) Dr. Chhaya Prasad (second from left), Ms. Deepti Kanade (third from left), Dr. Abraham Paul (fourth from left) and Ms. Sohini Chatterjee (third from right).